I first learned of the Algorithmic Art Assembly via colleague Joshua Kit Clayton. I knew nothing about it other than that it would be a weekend themed around art, algorithms and all curated by a guy named Thorsten Sideboard at the Gray Area Foundation for the Arts in San Francisco. I knew I had to attend! 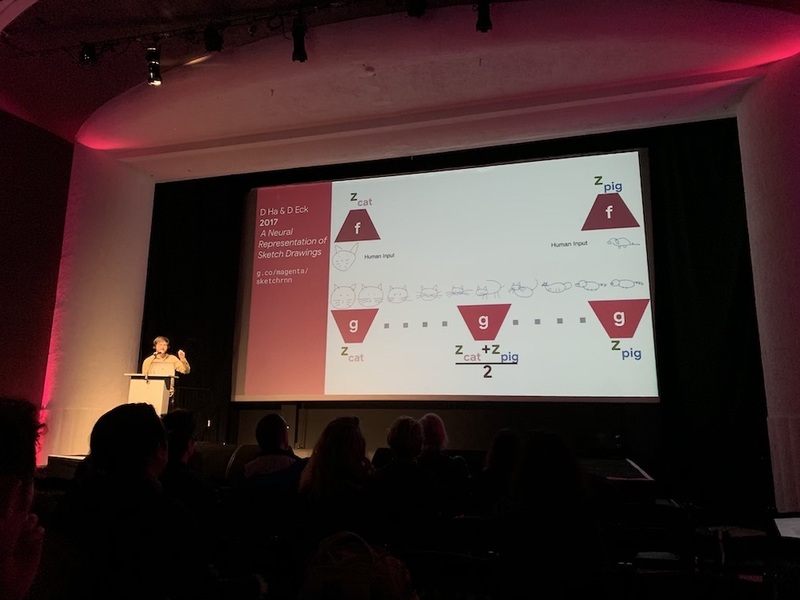 My slightly delayed flight out of LA meant that I made it to a gloomy and wet San Francisco just in time to grab a coffee next door to Gray Area and sneak in the door in time for the first talk. I knew little about most of the speakers, but I arrived with an open mind and open ears ready to listen and absorb. 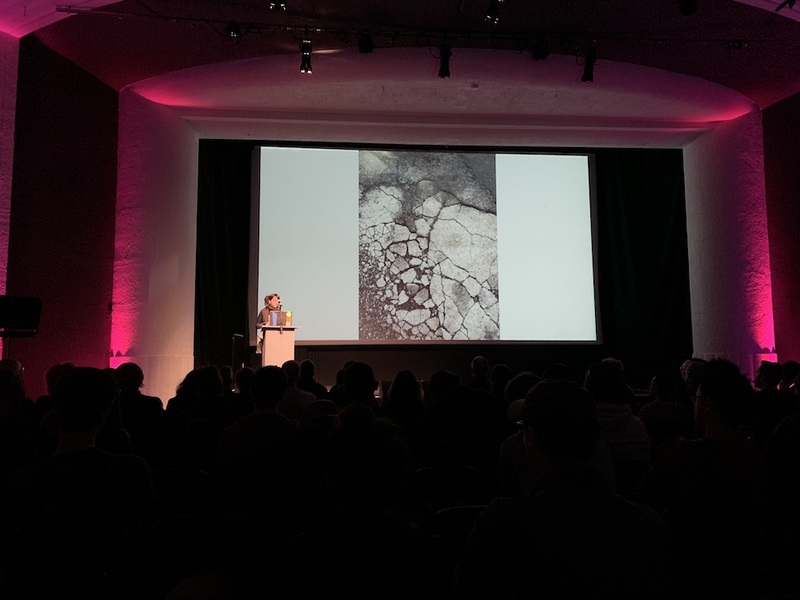 The opening talk, 'The Woodshed is a Black Box', was from Marc Weidebaum, who has run the Disquiet Junto for over two decades. He spoke about his inspiration for starting it and spoke at length about “woodshedding" – a term from the world of jazz that can be applied to many forms of creative practice. I’d not heard the term before, but the way Marc presented it, it certainly made me rethink the way in which I work and experiment to develop new work, and develop rules to help shape, drive, and fuel it. I think my favorite thing about Disquiet Junto is that there are no winners – that the work is made in one sitting and that it’s probably not finished, straight from the woodshed. Adam Roberts from Google’s Magenta Project took the stage next. The project is something I’ve heard bits and pieces about for years now but I was excited to hear, see, and get an in-depth overview directly from one of its main developers. A lot of the musical outcomes of the project can be seen here. I’d encourage you to go and have a play. 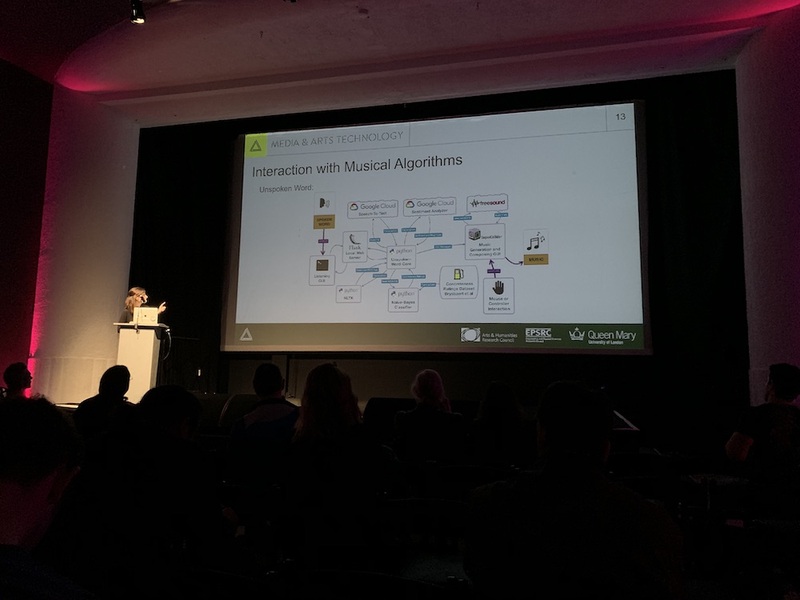 Two sections of his talk really struck a chord with me: making music with Generative Adversarial Networks (GANs) and the Ableton Live plug-ins that the Google Magenta team have developed and released here. One piece that Monica brought to our attention was a GAN-based machine learning project by AI artist Robbie Barrat and painter Ronan Barrot - a phenomenal project that combines ephemerality, GANs, and notions of voyeurism to make unique viewing experiences for every viewer. 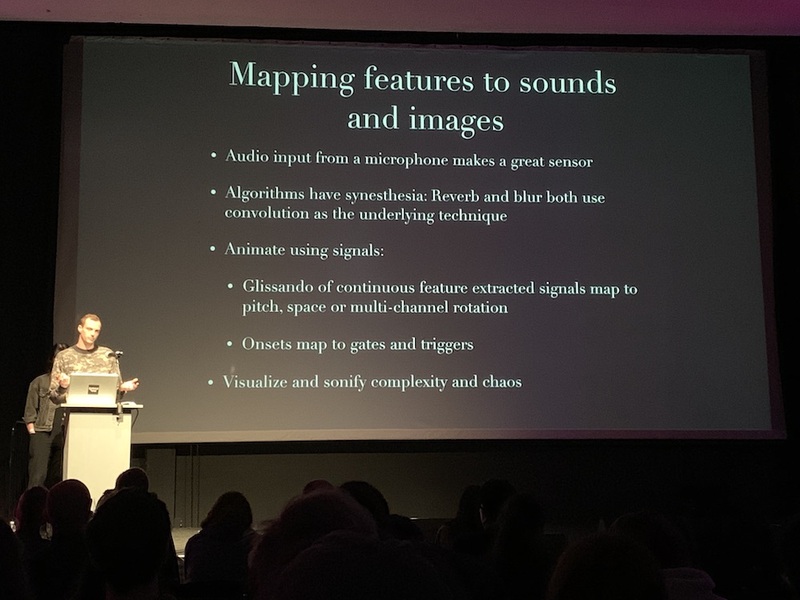 Elizabeth Wilson’s talk 'Algorithms, Music and Machines' brilliantly brought to the audience's attention how most machine-driven voice applications and hardware are situated with a female voice (Siri, Alexa, your GPS etc. ), and how such a gender disparity reinforces gender biases as soon as we interact with and command these devices. I liked how Elizabeth pivoted from this to talking about how machine learning can act as a creative tool to free creativity rather than trammeling it. What will be the next digital hardware/software tool that allows us to take sound design, music, and visual arts to new realms? Machine learning is at the forefront of much of this development. I was getting hungry, so I snuck out quickly for one of the Mission District’s most famous burritos at Taquería El Farolito. Don’t get me wrong - I still firmly believe LA has the best Mexican food outside of Mexico, but there’s something unique about the SF burrito. My colleague Madalyn feels like the differentiator is that LA uses more cilantro in the salsa. I think she might be right! 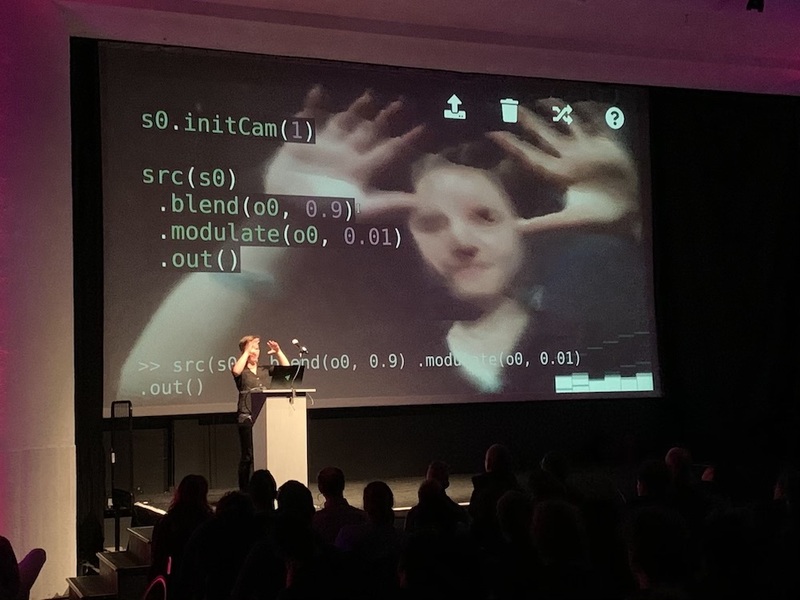 I was only gone a short while and came back in time to experience “Blobchat,” an excellent live coding/chat/music but silent conversation between Yotam Mann & Sarah Rothberg. It was a nice break between the more informative panels and provided the most laughs of the day. 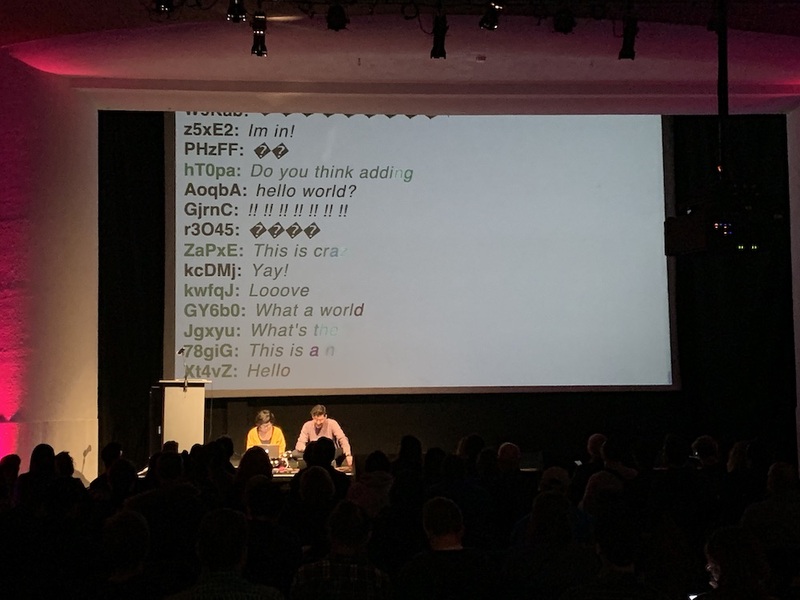 Despite being the presentation with the fewest spoken words by far, the unfolding conversation between Sarah & Yotam across their Blobchat live coding was incredibly engaging from an audience standpoint. It was made all the more so when they popped up a URL so that the audience could jump in for the Q&A. This moment during the presentation really made me start to appreciate the careful planning and curation that Thorsten Sideboard had put into the AAA weekend. Next up was longtime local contributor to the area’s experimental music scene Jon Leidecker, who set forth one of the most informative presentations from a historical perspective of the whole weekend with his talk ‘United Feedback.’ He proposed that the seemingly recent interests in generative music and creative machine learning can trace their origins to the earliest electronic music studio in the United States, run by Louis and Bebe Barron. Jon’s talk traced commonalities in the works of the Barrons, Vladimir Ussachevsky, David Tudor, the members of the Sonic Arts Union, Eliane Radigue and Roland Kayn (some of these names were new to me as an Australian, and sent me down a number of Google rabbit holes to discover new and exciting works from past decades gone by). The talk left me pretty excited to see his live set (as Wobbly) later in the evening. Windy doesn’t write code. She doesn’t use software. She doesn’t even need computers at all for her artistic practice, but algorithms are deeply embedded throughout everything that she does. Windy works with rope, making many thousands of types of knots from simple to complex, combining them in or in unison to create complex installation-based public art works. She described setting herself a challenge a number of years ago - to learn a new knot every day for a year. Over time, the algorithmic practice allowed her to achieve an incredibly high level of proficiency in knot-making and ended up establishing quite an artistic practice. We ended her presentation in a hands-on discovery of knot tying – a fun way to think about algorithms and end the first day’s panels and talks. I headed off to find Mark Fell (who had just gotten to town) rather than taking a break between the panels and the evening’s first night of live performances. I spent the next few hours chatting with Mark over dinner and a tasty Turmeric latte (stay tuned for a future interview). 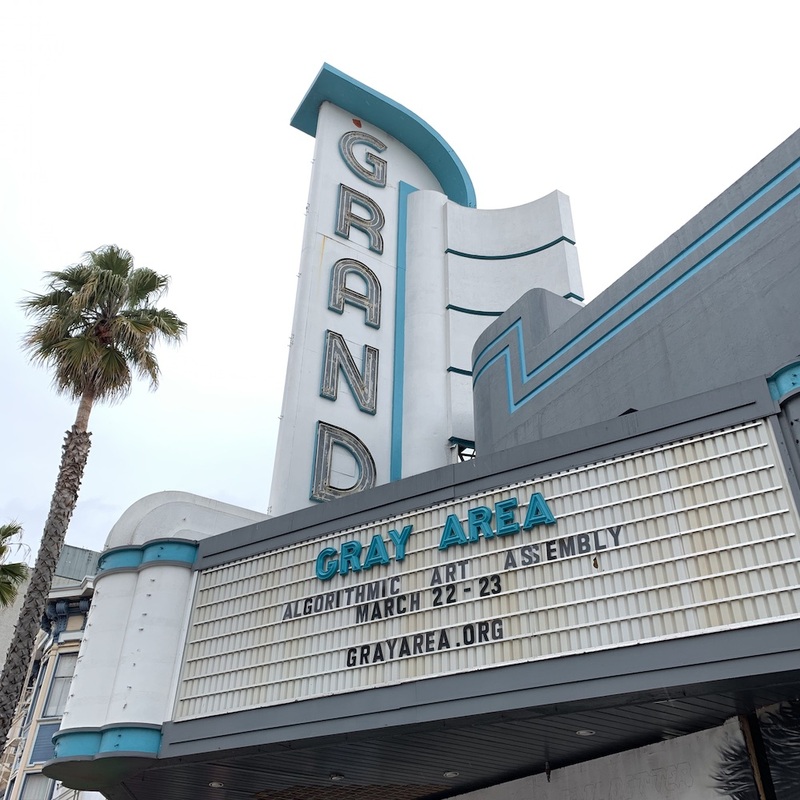 I headed back to Gray Area in time for the first AAA performance evening. I was looking forward to it as I had never seen any of the performers play previously, although I knew a few of their recorded works and had seen a few YouTube videos in the past years. 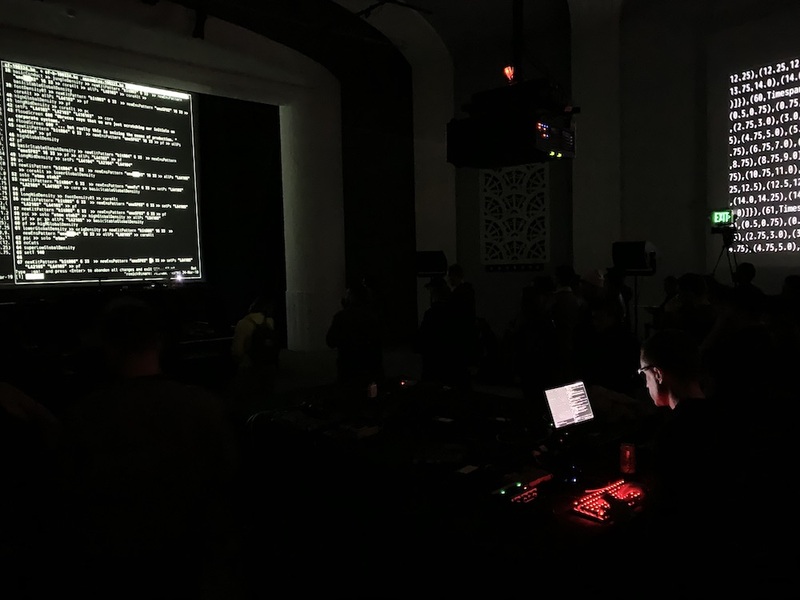 Charlie Roberts was the first performer, and his live coding work did not disappoint. He had a great audience with their ears focused on the sound and their eyes on the screen. He was followed by Wobbly (Jon Leidecker), who had a slew of gear spread across the table – quite a pile, to be honest: three or more iPads, a device that appeared to be some kind of MIDI playback device, a multisampler keyboard, and numerous other gadgets. Wobbly was busy to say the least, with several of the devices in combinations cross-talking with one another as the sounds transitioned from abrasive density to sparse noise and back again. Wobbly’s performance stood in perfect contrast to Charlie’s set; we were clearly in for as diverse a set of performances and we’d seen panel talks earlier in the day. Spatial struck a nice mix of live audio and live visuals, playing perhaps one of the most synesthetic performances of the weekend. It took me a minute to refocus following Wobbly’s highly dynamic set, but once I did I was lost. 20 or 30 minutes went by in what felt like 2 or 3, and that’s how I knew Spatial had nailed it. I live for those moments of transcendence during live performance, and this one was on point. I was too spaced out to catch what they were using, but that’s a good thing. London-based Digital Selves turned in an explosive and dynamic set, and I started to see people move for the first time - some dancing, swaying, walking, really putting the space to use. That’s often not easy in a situation where people are sometimes more fixated on what’s happening on the screen. The performance space itself was set up in such a way (a kind of octagon) that you got a different sound in almost every corner of the space, regardless if people were playing in multichannel or stereo. It was during Digital Selves set that I really moved around a lot and noticed this - it was quite special. Kit Clayton – a colleague of mine at Cycling ’74 for many years – was up next. I’d only seen him play once, in his Kit n C.l.a.w.s duo. However, I had heard about this “FM style” solo set he’d been working on the past few years and was very curious. 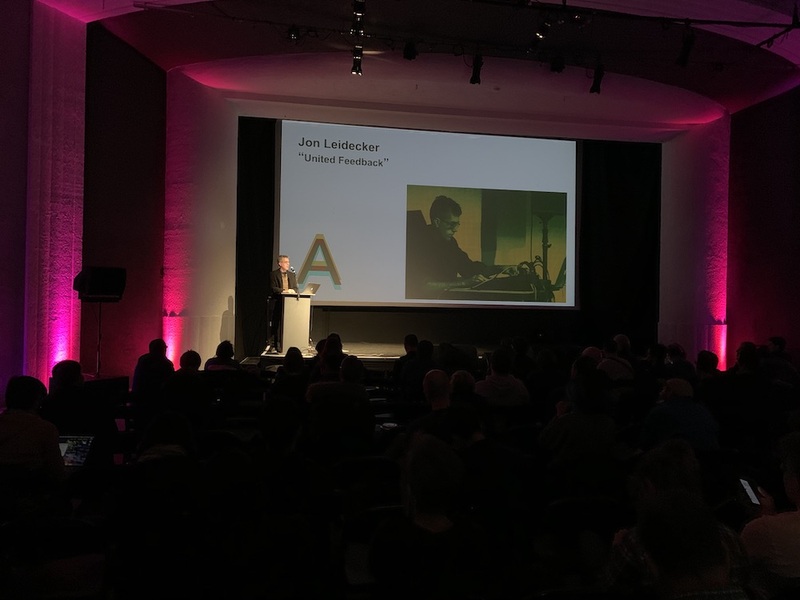 Joshua’s set was a labyrinth of immersive FM synthesis that morphed between succinct textural percussive elements, deep temporal sound beds, and glacial type shrills - often at times combining all three and more. It was highly dynamic but steered clear of falling in any kind of beat-oriented dimension. Calling it ambient certainly wouldn’t do it justice, it was a set by someone with a deft hand and skill that comes only from decades of playing live and listening. A switch to a full on synesthetic frenzy followed Joshua’s immersive jaunt in the dark. AlgoBabez first showed up on my radar just recently when I saw the The Oxford Handbook of Algorithmic Music and wanted to know more about who was on the cover. It turned out to be them!! AlgoBabez (Shelly Knotts and Joanne Armitage) were joined by visual live coder Olivia Jack. As I was saying, it was a full-on synesthetic onslaught; I was so impressed that I hardly knew where to look or listen. I’m unsure how often the three have performed together but if it was the first time, I was none the wiser: they were completely in sync. I stood looking over Olivia’s shoulder (on the opposite corner to Shelly and Joanne). Until that moment, I’d never seen someone live code visuals in the browser. It was quite impressive to say the least and clearly something she has spent time crafting, honing, and practicing. Next, I turned my attention across the table to Shelly and Joanne. If you closed your eyes and listened you would be hard pressed to know there were two people making sound on two different machines - always a great sign of unity. While I really enjoyed watching them code, play, and make noise, I particularly appreciated what appeared to be the more candid moments where they appeared to have one machine go down, laughed it off, and regrouped while the other person covered. That kind of friendship and dynamic is really special in live performance and I really appreciated it. (I think most people were none the wiser). Last but certainly not least was Kindohm (live coding). Through a shout-out tweet by Renick Bell (who you’ll hear about later) I’d come to check out some of his previous work and was excited to see him live. Kindohm kicked off his set with a slowly evolving set of syncopated drum hits - building, tearing away and layering on an evolving/dissolving audio sample “artificial intelligence.” From there he went deep. Using Tidal Cycles (I think that’s what he was using. I know of it, but I’ve never touched it), Kindohm put on a dark, abrasive, tectonic, glitchy set. The audience was really absorbed in it, hearing it unfold on such an immersive sound system - we were literally inside Kindohm. For me as a listener, everything simply disappeared - time, thoughts, tiredness – and, for that moment, I would have been quite happy to stay there. The last few hours of performances definitely transcended some kind of time space continuum; before I knew it I was traversing the Mission district back to my hotel, to rest and get ready for day two. After that first day of talks and the performance evening, I slept like a baby. Before I knew it my alarm was sounding and I was off to meet my colleague Madalyn Fernandez for some extra work (see Expo ‘74) I was excited, as she was joining me for the panel talks. After some breakfast and planning, we headed over to the Gray Area Foundation for the Arts to get straight into the talks. Adam took us on quite a journey. He spoke about the algorithmic nature of gambling and how far it stretches back through history, gardening and Brian Eno, MIDI Sprout (It’s awesome. Check it out! ), and how when you see true randomness it never actually seems random enough. While his mention of the book On Growth and Form was not the first I’d heard, it’s firmly on my to buy list now. Jules Litman-Cleper’s 'Queering Generativity, Querying Generativity: Generative Algorithms and Postnatural Narratives' talk was riveting. She spoke at length about growth algorithms, nature and life simulations, many aspects of which are informing my current practice and work. I was on the edge of my seat. It was great to hear her sum up differential growth as equating to “Randomize and smooth, rinse and repeat,” but what I really enjoyed was how she dug into the core properties and nature of algorithms and how they’re actually too perfect. When you actually observe the world around us, it’s not perfect, crystals have errors, but in some way they’re more perfect. Jules left me with plenty to thinking about and even more to research. 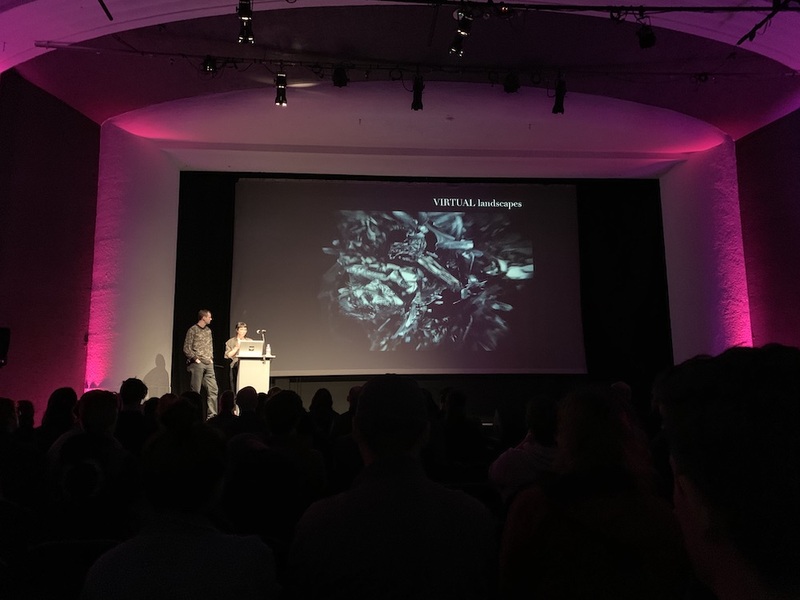 Chelley Sherman and Christopher Latina's presentation on ‘Perceptual Geometries’ began with Chelley speaking at length about her virtual reality audiovisual works. She spoke about her experience developing this work and touched on a side of VR that I had never considered: virtual reality for medical use. She talked about how VR has allowed her to perceive herself differently by viewing herself in new ways through conscious (virtual) out of body experiences. As VR across the world develops and computing power continues to grow, suddenly I could imagine all kinds of new possibilities for VR not purely rooted in gaming and art. Chelley then passed the talk to her sonic collaborator at Georgia Tech’s Center for Music Technology and Dolby Labs, Christopher Latina. Chris focused on the visualization and sonification of audio signal features used in music information retrieval. Chris talked about Mapping features to sound and images, how algorithms have synesthesia built-in, and how reverb both use convolution as the underlying. I particularly liked how he talked about animating signals. But the one part of the talk that set my mind on fire with possibilities was the mention of self-adaptive feature feedback synthesis. While it may not be a new way of working, it’s a technique one rarely hears about. The idea is that using features as continuous signals is more gesturally familiar - feeding them back creates a more complex or cognitive circuit, which I found refreshing, as opposed to the ways in which audio feedback is most commonly used. We were next treated to 'A Future Sport Manifesto' by Marque Comblatt (who all you burners out there might know better as Water Boy). Marque has formed the Museum of Future Sports and was there to tell us more about it. Future Sports are rooted in digital, virtual and immersive technologies, and connect with audiences on new, interactive platforms. What was interesting to me was that - at first – I expected that we were going to see drones. But as Marque’s talk unfolded, I realized that throughout history we’ve seen many emergent technologies turned into sports as Marque reeled them off (Robot Wars and Scalextric to name just a few). He wrapped up his talk by racing a drone in FPV around the room while completing a Q&A with the audience. Most notably he’s created a program that will run in San Francisco this summer called STEM Education. They’ve acquired a warehouse and will host educational events for young people that involve programming classes, robot wars, drone building & racing, and a whole host of events this summer. Stay Tuned! SpaceFiller’s talk ‘On the Edge of Chaos’ posed some powerful questions: Chaos emerges spontaneously in even the simplest systems, and when it does, it renders those systems impossible to predict. What conditions must exist for chaos to arise? How does chaos differ from randomness? How does chaos relate to complexity? Throughout the course of their presentation, they ran us through these questions and how they related specifically to works they’ve created. 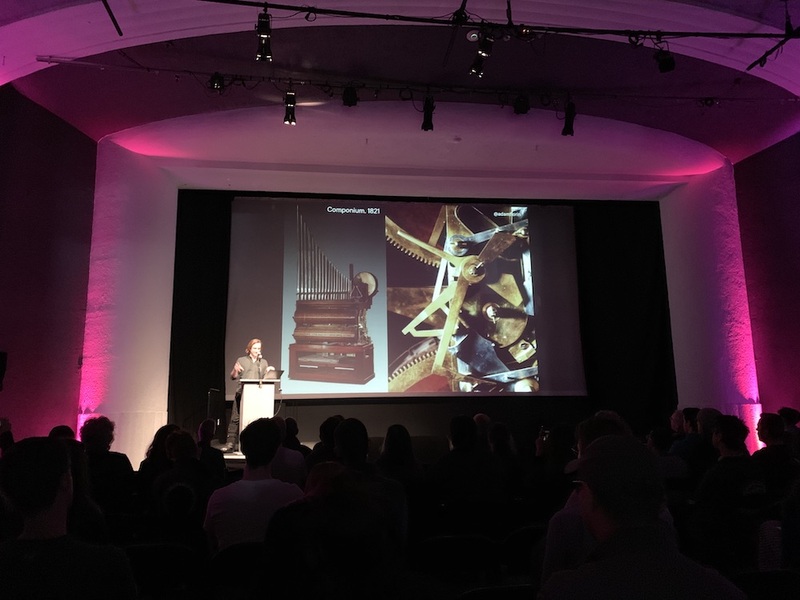 It was great to see this talk because - like Windy the day before, Marque and the others - we further considered algorithmic works of multidimensionality, outside of the 2-dimensional screen. I really recommend going to their website to find out more about them and their incredible work. her live coding in the browser development. Having seen Hydra in action the night before, it was insightful to hear some of the inspirations and reasoning behind the development of this language. One of my favorite aspects of Hydra is the ability to share your work simply via social media. Then there was Olivia Jack (AlgoBabez' collaborator from the previous evening) presenting Hydra, her live coding in the browser development. Having seen Hydra in action the night before, it was insightful to hear some of the inspirations and reasoning behind the development of this language. One of my favorite aspects of Hydra is the ability to share your work simply via social media. For an example, go here. Close the window and modify the code. Then when you’re happy with what you’ve made, click the Upwards Arrow in the top right corner to share your work on the Hydra Twitter account. Your work can then be download and experienced in real-time by others in the browser. 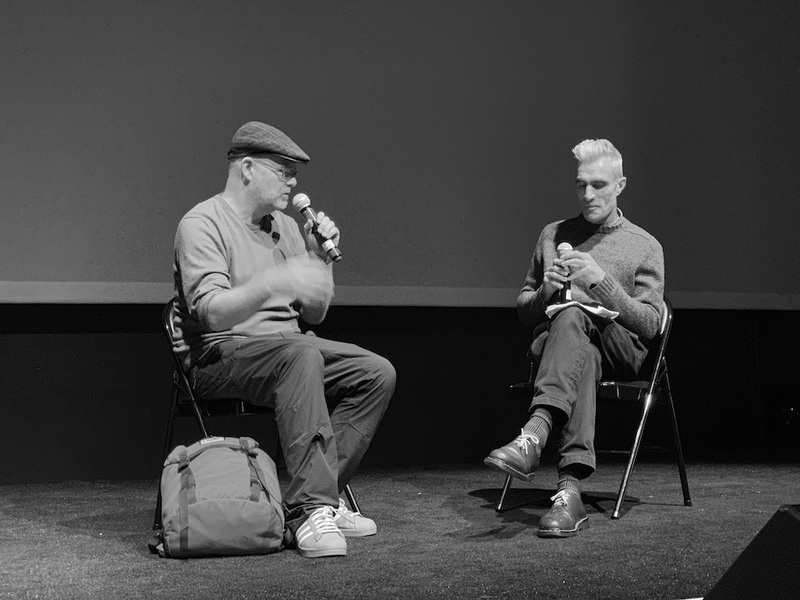 The last of the panels was a Q&A between Thorsten Sideboard and Mark Fell. Funnily, early in the Q&A, the front page of Mark’s website came up. While Mark said it’s highly likely the young person who wrote this got in a considerable amount of trouble, he actually thinks it’s quite brilliant. I think the takeaway was that pursuing your own avenue of research and creative development can easily be skewed when concerning yourself with what others are doing - more so now, with the advent of social media. The evening's bill was an eight-artist series that started off with a set by Sebastian Camens. Amusingly, Sebastian and I had messages over Instagram in the past — about cats, of course! His live coding set is quite different to what I heard the night before, I got the sense of a more experimental improvisational approach (sonically) and less structured straightforward rhythmic material, which I thoroughly enjoyed. His set wrapped up quite quickly and left me wanting more - also a good thing. A live coding set from Spednar was up next. I'd met him earlier in the day and had enjoyed a brief conversation, so I was curious about what he'd be doing. It was wickedly good, and I had a prime position, being able to close enough to watch close up and see the screen, and almost perfectly positioned sonically. 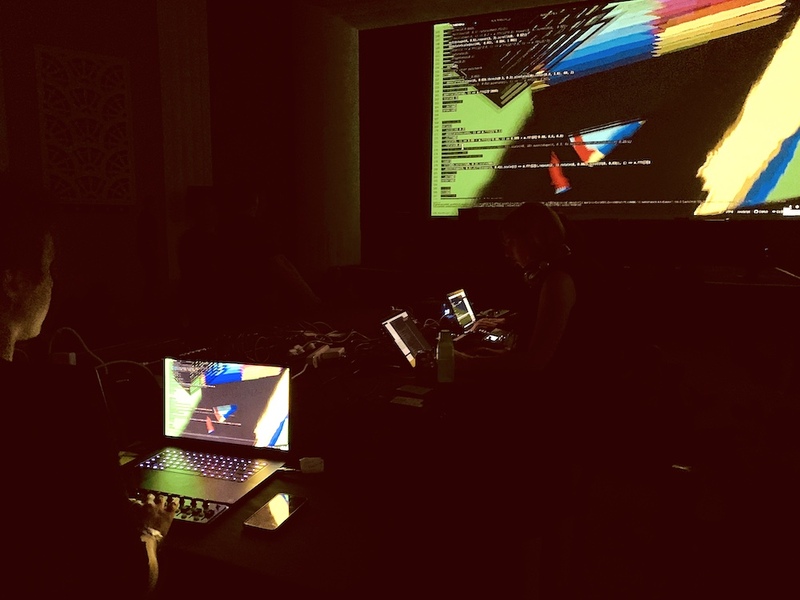 Spednar was joined for his set by Kindohm, live coding the visuals to make for a very dynamic A/V set — something like rainbow-colored tectonically sized glaciers colliding!, Both of these artists are clearly comfortable with their tools and in front of an audience. William Fields continued the audiovisually-oriented sets (Thorsten expertly curated the sets to give the audience a break from the live coding, which I enjoyed). I’m unsure as to what William was using, but I didn’t need to know. Instead, I just kicked back and absorbed the sonic bed and visual stimuli. Visually, his set evolved in and through number of complex three dimensional realms that reacted to his live audio in a number of different ways. It appeared is if there was some kind of bidirectional feedback between the visuals and audio, but I can’t be certain of that. Shatter Pattern (Jules Litman-Cleper) immediately followed with a performance that included a complete change in instrumentation (the first of the night). Jules appeared to be using a series of guitar-style effects pedals, a few Korg Kaos Pads, and — last but not least — her voice. It was a nice break the sonic trajectory for the night and the audience appeared especially attentive, as I believe Jules was the only performer of the entire weekend to use her voice as a part of her performance. TVO was up next! I believe he was using Max/MSP to create a dark, sinister ambient set shrouded in splintered reactive visuals, little to no rhythmic material with dense bass undertones. He engulfed the room in a hybrid dense mass that transcended time. Before we knew it, it’s the end. I was pretty excited to see/hear Renick Bell, who followed TVO. He’s someone who had come onto my radar in the past 6 months thanks to a few recommended mentions of his work from my friend, Joshua Eustis (Telefon Tel Aviv). Renick Bell has long been a part of the algorave scene as a facilitator and programmer, having created his own language called Conductive. He didn't disappoint, dropping straight into speaker-tearing, shredding syncopated kicks, bass, hats and more. He’s clearly very proficient and well-versed at using the language he created live, taking moments out to write/code messages to the audience without missing a beat. While his language Conductive is a black box for me, it was still completely immersive to watch it all unfold on the screen in front of you, to see the code and hear the resulting sound - The intricate timing, offsets, syncopation and more were simply outstanding. W00dy followed Renick, with a really nice introduction via Renick’s live coding —I can’t say I’ve seen a handoff quite like that before. W00dy perhaps had one of the more "typical" live setups that I’ve seen over the years, consisting laptop, an APC40, an audio interface and a few other bits and pieces. She did one thing many don’t, however - she turned OFF the laptop screen (respect!). W00dy knows her gear inside out, and that in itself is admirable as we transverse the times of maximum G.A.S in the electronic music. She’s no long playing a controller and instead it’s an instrument - an absolute joy to watch. In terms of the sound, let me give you a hint: W00dy’s latest release is called ‘Relentless Kickdrum’ tehehehe. Other terms that could be substituted for "relentless" could be pounding, onslaught, brutal, slaying… You get the idea! But it’s in no way off-putting; if you weren’t into her sound, there’s a good chance you might have left much sooner during one of the other sets/thousands of kick drums. W00dy delivered an energetic, vibrant, danceable set and — in doing so, got the entire room moving to the point where those few persons sitting on the floor would have to have moved to avoided being trodden upon. Mark Fell wrapped up the entire Algorithmic Arts Assembly . Mark should be no stranger to a lot of Max users — he's been using Max and talking about it for the past 20+ years. Mark puts on quite a ride. Parts that most certainly derived from his work on the Multistability and UL8 recordings, with syncopation happening on multiple tangents at any one time. Something he was doing in performance that was quite different to the recordings that I particular enjoyed was the way in which he would suddenly just "pull over to the side the road" with abrupt changes, which I found quite refreshing. I'm certain he was utilizing new developments both in terms of set structure and sound, derived from his last release Intra. With quite a bit of sonic and structural material I don't recall hearing in his released material, I can't help but feel that quite a bit of his performance was new, and that we could see some new releases sooner rather than later. While I was more than happy to witness Mark play for the first time (having followed his music for so many years), his set felt short in comparison to the other performance for the weekend - he left me wanting more. Before I knew it, it was a wrap. 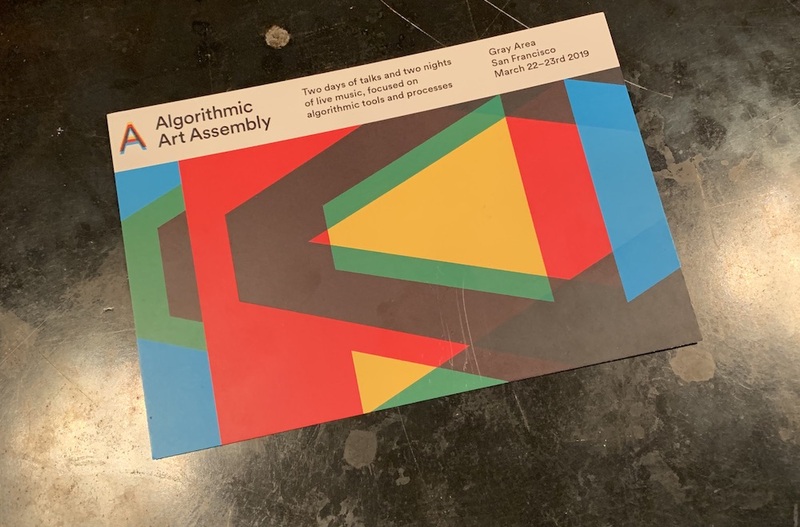 I would call the Algorithmic Art Assembly a huge success; I went home absolutely exhausted but so incredibly inspired for having seen and heard so much amazing music and art. I hope it happens again next year, and I hope that I can attend. Congratulations to curator Thorsten Sideboard, Gray Area Foundation of the Arts and all of those that helped the weekend run so smoothly. See you next year!